Cade's County was a hour long contemporary police drama series that ran on the CBS network from September 1971 to September 1972. Shot in the beautiful setting of Madrid County California, the stars were Glenn Ford and Edgar Buchanan. 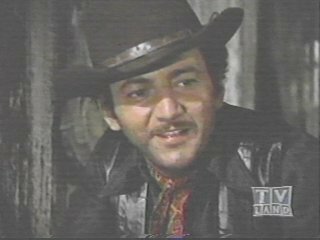 Bobby Darin was a guest on the episode "A Gun for Billy" which aired November 28, 1971. It was a interesting role for Bobby, who portrayed a ex-con who returns to the outside world after 11 years imprisonment. His character Billy Dobbs is a angry young man who has delusions believing that he was the real "Billy the Kidd." The episode also starred Linda Cristal, who played Celsa, (Billy's estranged wife) and future teen idol Leif Garrett who played Gabriel (Billy's son). This episode of Cade's County was shown in syndication as The Marshal of Madrid and at one time available on home video.